Completely remodeling a basement is no easy task. It can take hours upon hours of dreaming, planning and building to get exactly what you need. Whether you need to simply overhaul the aesthetics or you’re starting from scratch, We Build the Fun Stuff can get your basement done right. While some are spending only hundreds and others are spending tens of thousands of dollars, the extent of how much remodeling you want to do is totally up to you, your budget and your ambitions. What’s your next project? To get your creative wheels spinning, check out these insanely fun basement renovations. Ever wonder what’s possible with your basement? Whether you need the ultimate wine cellar, sprawling wet bars or a space fit for a king, fun will always bring the family together. Make your basement your favorite room in the house—no matter how dark, damp and ugly it is right now. This basement busted all limitations. When it comes to the ultimate in fun and repurposing your basement, think about using the floor as your very own arena. 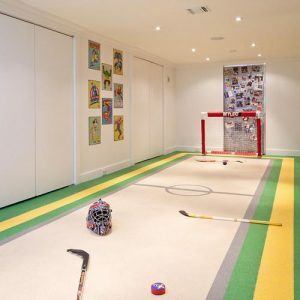 These hockey fanatics made their basement into their very own floor hockey venue. Imagine the fun that can be had when the family gets together. Have siblings versus parents, boys versus girls—the ultimate argument settler. Now picture the space with your very own bleacher seating while heart-pumping music is piped in over your surround sound speakers—it will be like you’re in your very own stadium without ever stepping foot out of your very own home! When you say “den,” pictures of stuffed deer heads mounted on plaques and lots of timber may come to mind. The truth is, though, that these retreats are more than just a quiet place with a lounge chair and wood paneling. Your personal retreat can create a spot filled with whatever you want and are fit for anyone in the family. 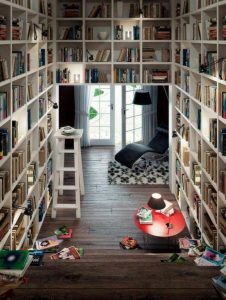 These basements can be themed or just full of the things you love, whether that be beer, books or Lego sets. We Build the Fun Stuff can create a space that brings your perfect idea to life. This is your space! So fill it with what you love. 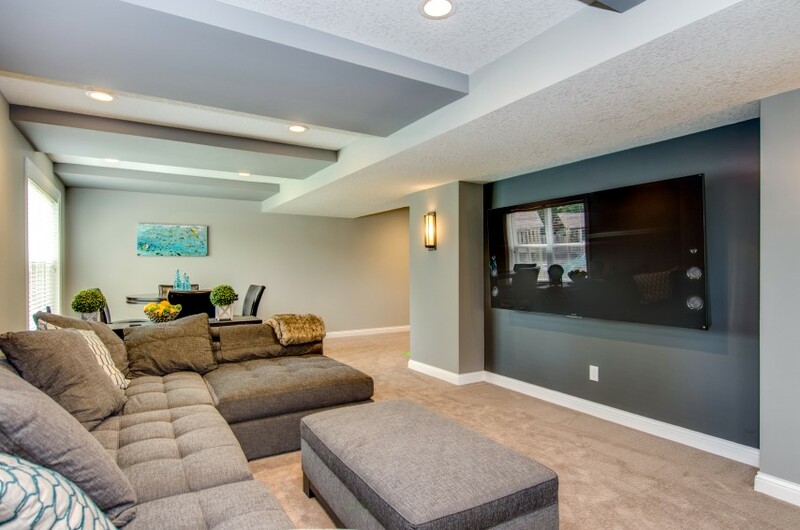 Why settle for cramming around your standard TV in your living room when you have a space fit for a personal home theater right in your basement? Home theaters can range from simple to elaborate—ordinary to extravagant. Feel like you’re part of the action with immersive sound, plush seating and a projector that shows the film on an entire wall. 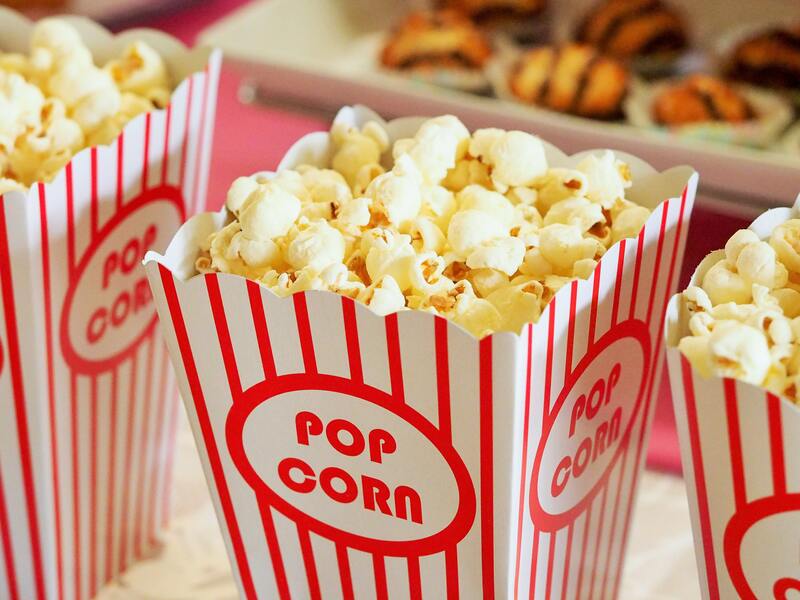 No matter how you want to watch your favorite flicks, We Build the Fun Stuff can make your theater dreams a reality at a price you can afford. 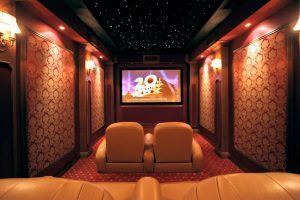 Plus, you’ll be shocked by the amount of equity a quality home theater can bring to your home with such a small investment. Wine cellars have been traditionally bland spaces. While you may have your wine tucked away in a dark corner of your basement, you could be showing off your vast collection. If you spent a long time curating your collection, why not invest in the ultimate storage to preserve it? Whether you need an great space to show it off in your home bar or you want an entire room dedicated to your wine inventory, we can help you come up with the best solution to your needs. 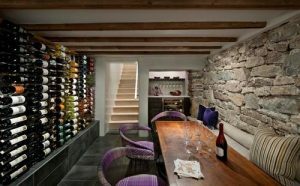 Get inspired by this wine cellar that also doubles as a place to relax and even host your own tastings. Few things are quite as nostalgic of childhood bliss than an arcade. Now it’s possible for you to make your own epicenter of fun. 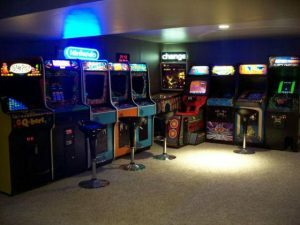 We Build the Fun Stuff can help your basement achieve the look and feel of your favorite arcade or game room with a vintage or modern feel. Picture bean bags plopped on the floor in front of a big screen and surround sound. If you’ve ever wanted a place where you can go to simply relax, have fun and play Pac-Man, scheduling an appointment is your next step. Check out this home arcade and imagine the hours of fun you and your family could have with your very own. No matter what you’re crafting, the key to success is organization. 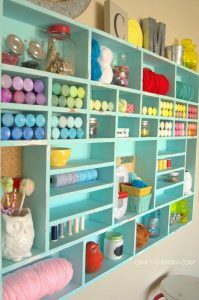 A cluttered craft room can quickly lead to chaos. 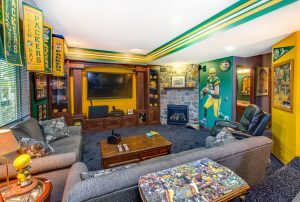 When you undertake your very own basement remodel, though, you can tailor your entire room to your specific craft. Need the perfect sewing room? No problem. Need a room full of storage for scrapbooking supplies? Check. We Build the Fun Stuff can create endless amount of built-ins and organizational cubbies for your crafty basement remodel. What could be more relaxing than your very own sauna? After you’re out in the cold shoveling, snow blowing, or playing with the kids during a long Minnesota winter, treat yourself to a relaxing sit in your sauna. Imagine letting the worries of the day out of you whenever you need. 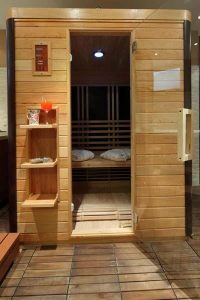 No matter what shape your basement is in now, a sauna can make it so peaceful and relaxing, it’ll be hard for you to remember that it was once an ugly unused space. Minneapolis is experiencing a boom in craft beer breweries. So it’s only fitting that We Build the Fun Stuff can build you your very own home brewing room where you can brew and bottle your own beer or wine. Create your own flavors and share with your friends without having to clutter up the rest of your house. Say goodbye to scattered pails, pans, containers and ingredients. 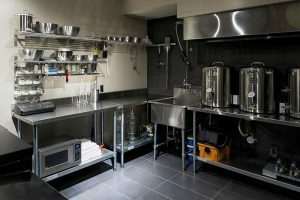 A dedicated brewing room can make it possible to tailor your setup to your exact brewing needs, whether you’re working on ales, lagers, wines or moonshine. 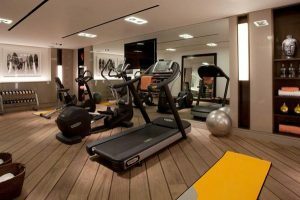 Great home gyms don’t just happen; they take careful planning and consideration so you can get the most out of your basement remodel. If you’re looking to create the perfect space for your home gym, you might want to look into the best wall covering, flooring and lighting to create that gritty gym feel to the upscale pilates feel you may be seeking. When buying a home, many people imagine the rooms filled with friends and family for holidays and get-togethers. Themed parties, potlucks, casual dinners—entertainment is a great bonus to owning a house over renting a cramped apartment. Your unused basement is often the perfect spot for your personal saloon. What are you waiting for? 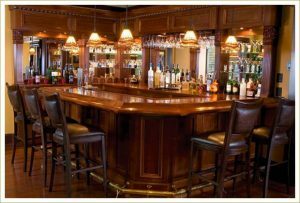 We can make you a beautiful bar top, a one-of-a-kind barback and a set of custom tappers to start the party right. Start thinking up your dream bar and throw the party you’ve always dreamed of! No matter where you get your inspiration, We Build the Fun Stuff will work with you to figure out how to get the most out of your basement. As you can see, possibilities are virtually endless. Make it fun, spunky, relaxing or calm—your basement is a part of your home and should be good for more than leaky pipes and a cold cement floor. We can walk you through from napkin sketch to construction. Setting an appointment today will get us in your door for a free consultation. If you live in Minneapolis, St. Paul, or anywhere in between, you’ve found the best basement remodelers this side of the Mississippi. Fun is waiting right in your basement. So, what’s your next project?